Revisiting the cartoon institution of the 1990s, Funko Nickelodeon Mystery Minis brings fans some of their favorite Nick characters in a blind-bag format. Highlighting subjects from Aaahh Real Monsters, Angry Beavers, Hey Arnold, Ren and Stimpy, Rocko's Modern Life, and Rugrats, all of which have Pop! sets, Funko Nickelodeon Mystery Minis is not short on variety. It's also not low on exclusives, as the four different formats each feature three figures that are not found anywhere else. 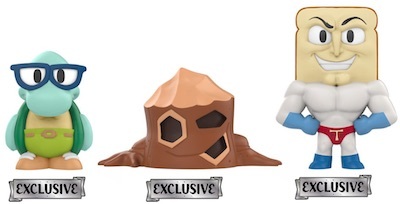 For the main version issued in most places, exclusives include Nigel Thornberry (The Wild Thornberrys), Oblina (Aaahh!!! Real Monsters), and Rocko from Rocko's Modern Life. 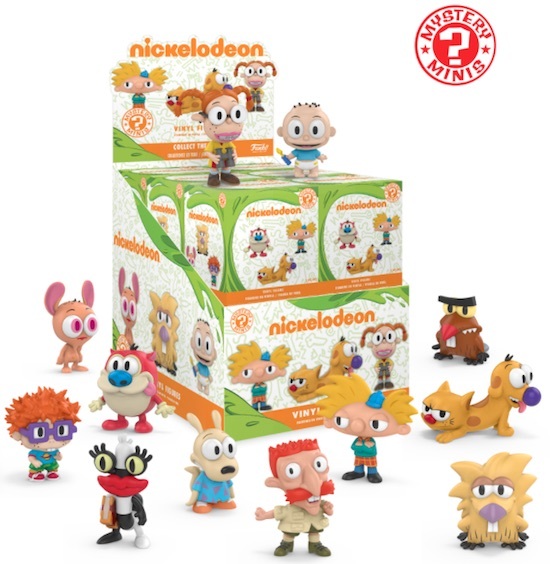 Buy Nickelodeon Mystery Minis on Entertainment Earth. GameStop is where you need to go for Filburt the turtle (Rocko's Modern Life), the superhero Powdered Toast Man (Ren & Stimpy), and Stump from Angry Beavers. Those shopping at Hot Topic can find Gerald Johanssen (Hey Arnold! ), Krumm (Aaahh!!! Real Monsters), and Reptar, Tommy's dinosaur toy in Rugrats. 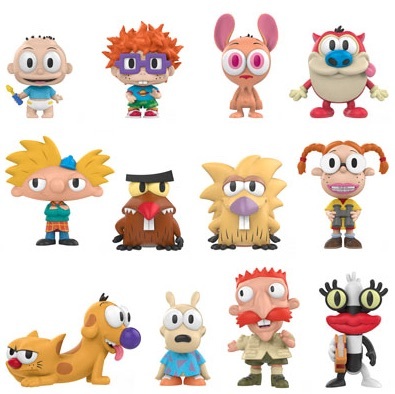 Funko Nickelodeon Mystery Minis also has three exclusives figures at Toys R Us, including Heffer Wolfe the cow (Rocko's Modern Life), Helga G. Pataki from Hey Arnold!, and the big-eared Ickis (Aaahh!!! Real Monsters). Although collectors know what to expect from the 21-figure set, the trick is getting all the Funko Nickelodeon Mystery Minis. Since each figure falls at different odds, it can get costly buying sealed boxes or cases to end up with many duplicates and an incomplete set. The Funko Nickelodeon Mystery Minis gallery and checklist below covers all the options, so collectors are ready to begin there search. Full rarity details will be updated once they are released. Main format odds listed. Exclusive odds will be added when avaiable. Nickelodeon FUNKO Mystery Mini STUMP 1 24 GameStop Exclusive Figure New!! Arnold Nickelodeon Funko Mystery Mini Hey Arnold! Nickelodeon FUNKO Mystery Mini TOMMY Vinyl Figure Rugrats Cartoon BRAND New!! Nickelodeon FUNKO Mystery Mini NORBERT Vinyl 1 72 Figure Angry Beavers NEW! Lot of 2 Funko Mystery Minis: 90s Nickelodeon Blind Boxes Factory Sealed New!